Glory: it will be ours. There’s something unnerving and all too familiar about the way Ava DuVernay manages to capture the supposed intimate moments between Dr. King and his wife, Coretta Scott King, in “Selma.” Who of us have not had those sad yet all too real, gut-wrenching conversations with said black man as a black woman? Not necessarily one’s prompted by the FBI attempting to assassinate your character long before they leave you for dead; but the conversations when nervous laughter brought on by the comfort of humor when discussing the inevitability of death in the African American community. DuVernay did a very good job of showing how often the young’uns clashed with the old folk and the old folks bumped heads with the youths. The conversations between SNCC member’s, John Lewis (Stephan James) and James Forman (Trai Bryer) showed a difference in thought much like that of King and X. However, after Bloody Sunday it was clear that all ideologies led to the same river. DuVernay had a keen eye at authenticating the joint efforts of the Civil Rights era, as well the march in Selma. It is often overshadowed by King’s notoriety. 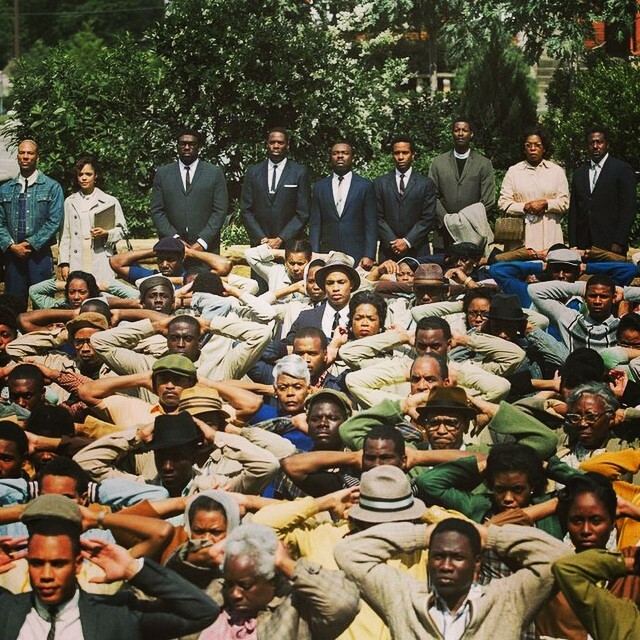 There are key scenes with Cuba Gooding, Jr. as Civil Rights attorney Fred Gray, André Holland as Andrew Young. Other noteworthy and instrumental individuals are James Bevel (Common), Ralph Abernathy (Colman Domingo), Cager Lee (Henry G. Sanders), Jimmie Lee Jackson (Keith Stanfield), Bayard Rustin (Ruben Santiago-Hudson), Richie Jean Jackson (Niecy Nash), James Orange (Omar J. Dorsey), Viola Liuzzo and Annie Lee Cooper. Cooper played by none other than Oprah Winfrey. Historically, she is known as for standing up to Sheriff Jim Clark by punching him after Clark billy clubbed her in the neck. Aisha Coley brilliantly selected Nigel Thatcher as the movie’s Malcolm X. David Oyelowo and Carmen Ejogo are seamless to the spirits of Dr. King and Coretta Scott King. It can be argued that Lyndon B. Johnson (Tom Wilkinson) was chosen as President Kennedy’s running mate, solely to pacify the South. Before July 14, 1960, Kennedy and Johnson were rivals. Johnson was from Texas. Johnson became President after the untimely and tragic death of the president. Johnson didn’t have Robert F. Kennedy, a forward thinker, as a brother or campaign manager. “Prejudice exists and probably will continue to … but we have tried to make progress and we are making progress. We are not going to accept the status quo,” Bobby said in 1968. Thus, Johnson’s sluggish haste toward inaction is understandable. It also forced his hand and gave those in the trenches renewed diligence. Progress must be taken because it is not guaranteed. This movie is relevant because those marches are still happening, confronting many ills. Sadly, much hasn’t changed. That’s what Ava sees, at least I think so. Do they ever wonder what it must feel like to have to prove you are human too?